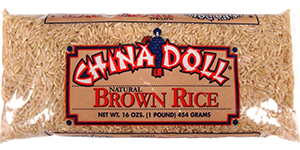 *Rinsing before preparation will not destroy any natural vitamins which are part of brown rice itself. 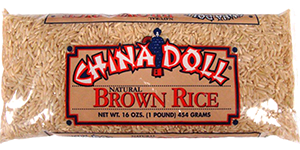 *Cooked brown rice can be used for breakfast cereal, pilaf, in salads, desserts or anywhere you would serve white rice. Stove top cooking instructions. Combine 3 cups of cold water, 1 tbsp. margarine or butter and 1 tsp. of salt in a large pot with a tight fitting lid. Bring to a rolling boil in uncovered container, stir in 1 cup of rice, and let boil again. Reduce heat and simmer for 45-50 minutes WITHOUT STIRRING. All water should be gone so remove from heat –but DO NOT STIR. Let rice sit covered at least 15 minutes before eating. Oven cooking instructions: Preheat oven to 350°. Using a buttered, covered container add 2-1/2 cups water, 1 cup brown rice, 1 tsp. salt, 1 tbsp. butter or margarine and any other seasonings you prefer to taste. Cook covered for 75 minutes. Microwave cooking instructions. Combine 1 cup rice, 2-1/2 cups cold water, 1 tablespoon margarine or butter and 1 teaspoon salt in a 2- to 3-quart deep microwave baking dish. Cover and cook on high (maximum power) for 5 minutes or until boiling. Reduce heat to medium (50% power) and cook 30 minutes. Fluff with fork and serve. Storage: We recommend storing in an airtight container in a cool, dry place or refrigerator or freezer – keeps indefinitely this way. Not a significant source of calories from fat, saturated fat, cholesterol, sugars, vitamin A, vitamin C and calcium.